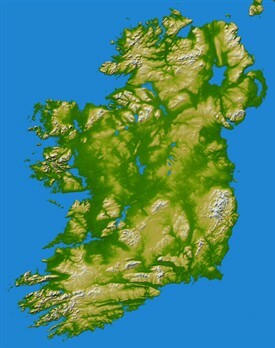 Ireland has historically been divided into the four provinces of Connaught, Leinster, Munster, and Ulster. There are several counties in each of these historical provinces. Most often passed down in family lore are the provinces of Connaught and Ulster. This is especially true in the cases of Scots-Irish (Ulster-Scots) who were concentrated in the historical province of Ulster and of Catholic immigrants who stated they were from Connaught. If a province of origin is known, research can concentrate on narrowing the place of origin within that province. Searching indexed tax or other records for the province may be practical for an uncommon surname but not for a common one such as Kelly or Lynch. There are geographical region names in Ireland which the immigrant may have identified as a place of origin, some large and some small. 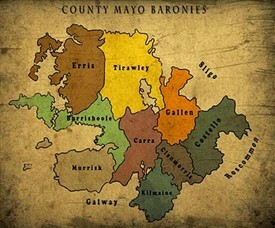 For example, family legend may state an ancestor was from Connemara, the mountainous and coastal region of western Galway; the "midlands" in the County Longford area; the "lake district" in County Fermanagh; or the Dingle peninsula in County Kerry. Identifying these geographical regions may be the key to finding where the ancestor was from. For example, if an ancestor originated in Connemara, the Galway Family History Society West Heritage Centre could be contacted to check church indexes for western Galway. This may identify in which parish in the Connemara region the ancestor originated. The county name is most often preserved as a place of origin in Ireland. The island was historically comprised of thirty-two counties. Queen's County became County Leix (or Laois) and King's County became County Offaly after Ireland was divided in 1921. Derry and Londonderry are interchangeable names for the same county. There are two types of parishes involved in Irish genealogical research, the civil parish and the church (or ecclesiastical) parish. These are not the same and should not be confused. The Church of Ireland and the Roman Catholic Church had separate parish systems. Since the Church of Ireland was the Established Church, its parish boundaries were often the same as the civil parishes. There were not enough members to warrant a Church of Ireland parish church in each civil parish. One parish church could thus serve several civil parishes. Also, there could be more than one Church of Ireland parish within a civil parish. This was especially true in Northern Ireland where there were greater numbers of Church of Ireland members. The civil parish is an important boundary for land and taxation purposes. It is also the boundary used to catalogue many Irish records at several repositories including the Family History Library (FHL) in Salt Lake City. With the re-emergence of the Roman Catholic Church in the later eighteenth century and with full Catholic emancipation in 1829, the Catholic parish system rapidly expanded. Many new Catholic parishes were established. A civil parish may have one or more Catholic parishes within its boundaries. The Catholic and civil parish names may or may not be the same. For further discussion of this topic, see Nora M. Hickey's article "The Relationship between Civil & Catholic Parishes" in Irish Family History. Many immigrants listed the civil parish as a place of origin. A Catholic parish may have been listed in church records or on a tombstone in a Catholic cemetery. Immigrants were asked where they were baptised when they got married. In this case, the ecclesiastical parish of baptism would be given. Maps of the civil parish boundaries of all counties have been published in Brian Mitchell's A New Genealogical Atlas of Ireland. Approximate Catholic parish boundaries in each county can be found in John Grenham's Tracing Your Irish Ancestors: The Complete Guide. Brian Mitchell's A Guide to Irish Parish Registers lists Church of Ireland parishes, Roman Catholic parishes, Presbyterian and other congregations within each civil parish. Samuel Lewis' 1837 Topographical Dictionary of Ireland indicates the congregations within each civil parish. The Ordnance Survey Memoirs compiled in the 1830s also list the congregations within each civil parish. Cities and towns in Ireland must be thought of in a different light than they are, for example, in North America. In Ireland towns are not townlands, but towns or villages may be located within one or more townlands. For example, the town of Draperstown in County Londonderry (Derry) lies in the three intersecting townlands of Cahore, Moykeeran and Moyheeland. When names of these populated places are given as a place of origin, caution must be applied. Immigrants often stated they were from a certain populated place such as Athlone (a town on the border of counties Roscommon and Westmeath), when in reality they were from outside the populated town in a nearby townland. Another word of caution concerns family legends stating that an immigrant was from Cork, Dublin, or Londonderry (Derry). First, these are all the names of both cities and counties, and the distinction can become blurred in family lore. Second, these cities were ports where immigrants left Ireland. What was stated in family tradition as the family's place of origin could have actually been the place of departure, and the immigrant may be from an entirely different County! The townland is the smallest administrative unit in Ireland. A townland is not a town, nor does it have a government. A townland is a surveyed piece of ground which may not even have people living within its boundaries. Townlands usually but not always have Gaelic names. A townland in Ireland may consist of anywhere between a few acres and several thousand acres. Townlands have specific boundaries which were officially surveyed in the 1830s by the Ordnance Survey. Due to their small size townlands do not usually appear on standard road maps. However, the Ordnance Survey has published modern maps of Ireland indicating townland names. Although the concept of the townland is based in antiquity, the actual mapping and defining of them goes back to the 1600s when the English Government was mapping Ireland to portion it out to conquering soldiers and others who were investing in Irish land. From the 1600s to the Ordnance Survey of the 1830s, many changes occurred in the townlands and their boundaries. This is reflected in antique maps and estate maps. A Census of Ireland, Circa 1659, edited by Séamus Pender, lists the townland names at that time and contains a full index to place names. 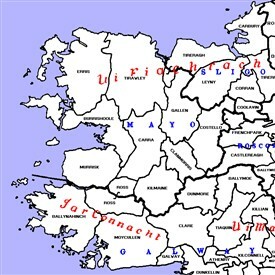 An example of changes in 145 years may be found in Andrew J. Morris' article "Irish Placenames," in Eirephile. 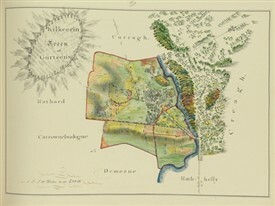 Morris included two maps showing the townlands in the East Kerry estate of the Earl of Kenmare. The map dated 1720 shows several large townlands on this estate. The other map dated 1865 shows many more townlands of smaller size. Since there may be many townlands of the same name in a county, it is important to identify the correct one. Tax records, land records, and other sources can assist in documenting the ancestral family in the correct townland. It may take some research to determine what the official spelling of a particular townland really is. Townland names can be found in the 1851, 1871, and 1901 townland indexes, all of which identify the civil parish in which the townland is located. The 1851 edition was reprinted by Genealogical Publishing Company. 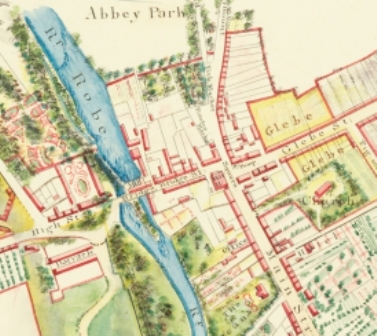 The townlands of Ireland are being placed in a computerized database on the Internet at the Ire Atlas Project web site (the complete 1851 Townlands Index is now searchable on-line. Within the official townlands there are other smaller subdivisions such as field and farm names known to the local people. There are also small communities within townlands not large enough to be towns; these communities have unique names and may only include a few houses. These sub-denominations within a townland ("Cherry Grove" in Croom civil parish, County Limerick, for example) are not listed in the 1851, 1871, and 1901 townland indexes. Sub-denominations may, however, be found in official records such as civil registration or on the Ordnance Survey maps of Ireland. For this reason, examining the "Manuscript Index to the Original 6" to the Mile Ordnance Survey Maps" may be the quickest method of determining in which townland, civil parish, and county an obscure place name is located. It is not uncommon for an immigrant to identify with one of these small parcels of ground rather than with the townland name. This article was originally published in The Irish At Home and Abroad journal of Irish genealogy and heritage (volume 5, no.1, 1st Quarter 1998) published four times yearly. This page was added by Averil Staunton on 23/10/2011. Now that I traced my roots to Ballinrobe, this was very interesting. Editor: Thank you Patricia and hope you find information of interest to you plus getting to know the place.